Mouth-watering round steak served with a rich creamy horseradish sauce. And so easy to prepare! 1. Cut the round steak into 4 equal pieces. Cut 2 garlic cloves in half and rub both sides of each steak with garlic. Coat a large skillet with cooking spray and place over high heat. 2. Add steaks to hot skillet and cook for 4 minutes; turn steaks and cook 3 minutes on second side. 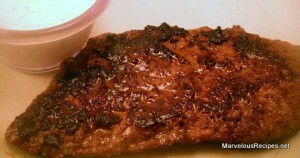 Reduce heat to medium; sprinkle steaks with 1/4 teaspoon salt and 1/8 teaspoon coarse ground black pepper. Cook an additional 2 minutes or until desired degree of doneness. 3. Mince the remaining garlic clove. In a small bowl, combine the garlic, sour cream, mayonnaise, horseradish, 1/4 teaspoon pepper and remaining 1/4 teaspoon salt; blend well. 4. Serve the steaks with the horseradish sauce. Makes 4 servings each containing 5 net grams of carbohydrate. While I don’t care for horseradish, this looks like a great way to cook round steak!